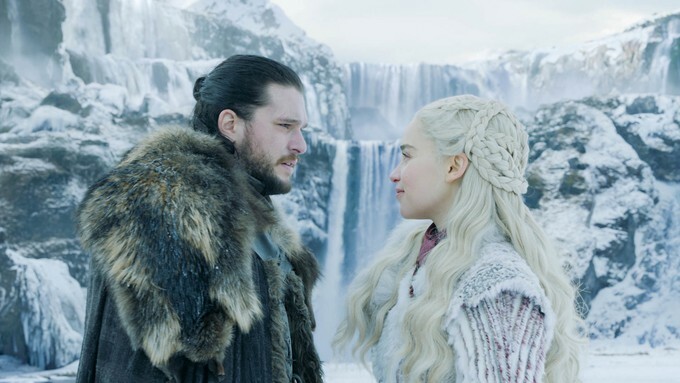 After much anticipation, the new Game of Thrones episode aired last night on HBO. We’ve craved new content for so long now. 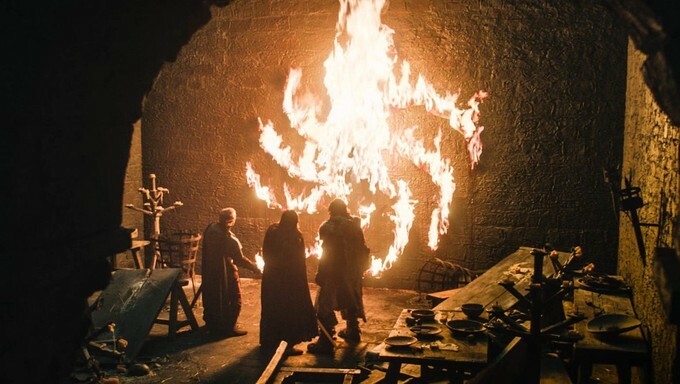 Did the “Winterfell” episode satisfy our hunger for something deliciously entertaining? Sort of. It felt more like an appetizer to get us ready for what’s to come, but a fairly successful appetizer. Before continuing reading, be aware this recap contains spoilers. 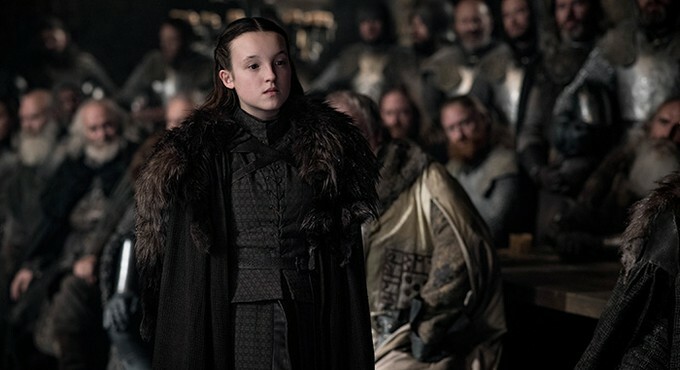 Beginning with a boy running to glimpse the waves of troops coming to Winterfell, the episode does contain a few shockers. Probably the most surprising one is that Arya appears happy on several occasions. She even laughs a little. Did you think that was ever possible? 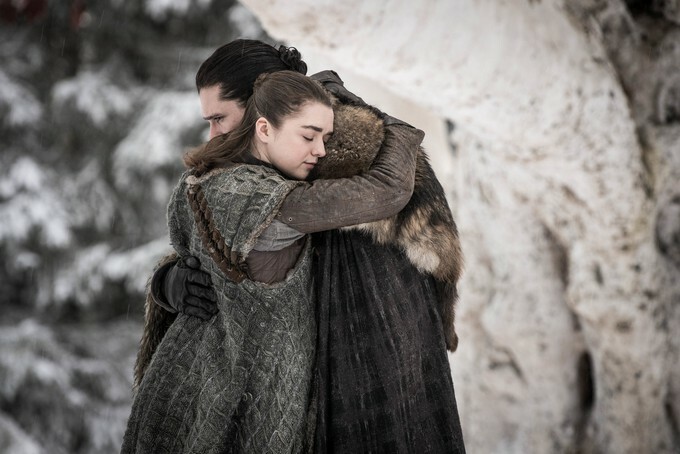 The little psychopath has a touching moment with Jon at the Godswood tree, makes it creepy for a moment when she warns him not to forget he’s family, then displays a sweet, contented smile as she rests her head on his shoulder. The most emotional moment of the episode, but I still don’t need any tissue. I’m certain tears will come in future episodes. Arya also encounters The Hound after witnessing Gendry giving him a dragon-glass axe. From her reaction to seeing him, it’s clear that the Hound remains on her hit list. Pity. I was hoping she’d let that go when she’d previously left him to die. Aria speaks to Gendry. Even though Gendry witnesses Arya's conversation with the Hound, he still flirts awkwardly with her. It seems to work as she responds well. Perhaps the two are meant to be, but I don’t know. She’s scary. 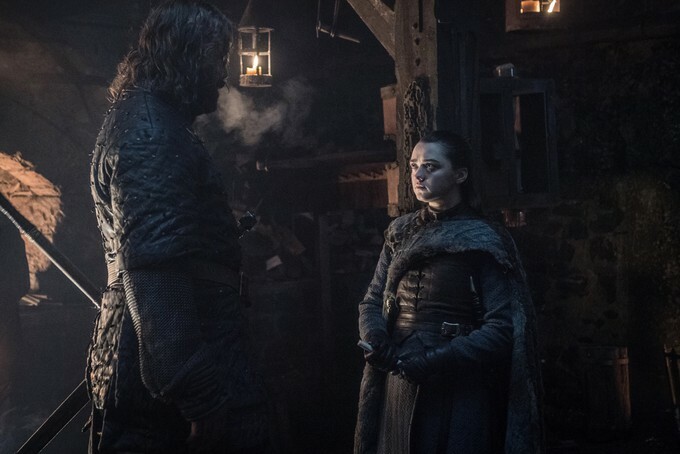 Lyanna Mormont gives Jon a piece of her mind regarding the fact he gave up his crown to support Daenerys. He claims he did it for the North. The Northerners disapprove. Daenerys and Jon share a dragon flight together, while Ser Davos, Tyrion, and Varys discuss the option of a wedding to unite the houses. When talking about the couple, Varys states the obvious: “Nothing lasts." Sansa criticizes Jon for his decisions and waxes superior. While I have some sympathy for Sansa Stark, something about her rubs me the wrong way. With teachers like Littlefinger and Cersei, it’s no wonder she’s become a conniving plotter. I feel like she judges the words and actions of everyone around her, and is always calculating the next moves she needs to keep her family safe. Seeming every bit as cold, she has become the Cersei of the North. Tyrion even comments that many have underestimated her and most of them are now dead. It feels like the writers are setting us up for a battle of the wits between the two women. Speaking of Cersei, she compromises herself to keep Euron fighting for her. After letting him into her bed, we see her drinking wine perhaps in an attempt to erase the memory. Should we assume that she was never pregnant and only used that to manipulate her brothers, or was she being sincere and just lost the baby since we last saw her? Or had it killed when Jamie betrayed her? If you think that Cersei won’t injure Jamie, think again. Qyburn interrupts an awkward foursome to make Bronn an offer. Cersei wants to pay him to kill the Lannister men if they survive the battle. I secretly had hoped that Bronn survives the whole thing and gets the beautiful woman and the nice castle he’s been longing for. However, I think what Cersei sets into motion here means that Bronn will not survive the final episodes. Elsewhere, Theon Greyjoy rescues Yara, who promptly headbutts him for leaving her with Euron in the first place. After Theon vows to go where his queen demands, she recognizes he wants to fight for the Starks and gives her blessing for him to go north. She suggests she’ll stay behind offering a safe haven where the dead cannot go. If they’re already dead, why can’t they just walk on the bottom of the ocean? Am I overthinking this? Jorah Mormont introduces Daenerys to Samwell Tarley. She thanks him for saving Mormont, but then reveals that she executed his brother and father when they wouldn’t bend the knee. As Sam makes a hurried exit after trying to process the news, he spots Bran lurking outdoors. Bran urges Sam to tell Jon about his parentage. Sam does, and Jon feels betrayed by Ned Stark, who lied to him his whole life. Sam explains that Ned saved Jon’s life by the lie. He also points out that Daenerys killed his family who were her prisoners. 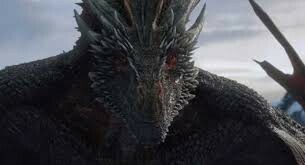 He poses the question if Daenerys would give up the crown for her people. 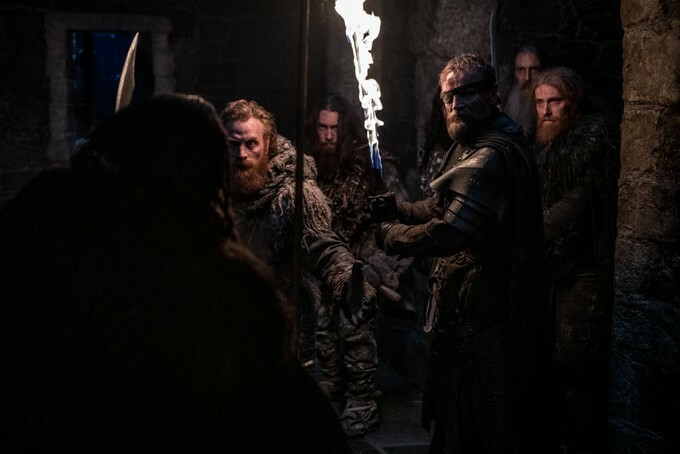 Men from Castle Black encounter Tormund and Beric among the ruins of Last Hearth and almost slay them because Tormund’s eyes are blue. He manages to blurt out “I’ve always had blue eyes!” The men relax a bit and join forces. They continue exploring the ruins, where they discover the Night King’s new artwork, with young Lord Umber as the creepy centerpiece. Best shock of the episode when it opens its blue eyes and screams. The episode wraps up with a hooded figure arriving in Winterfell. Once the hood comes off, we see a worn Jamie Lannister, who wears scruff surprisingly well. 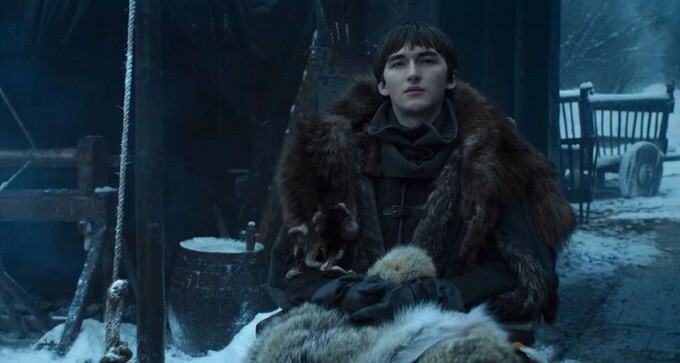 The first person he sees is Bran who doesn’t look too upset to see the man who pushed him from the tower in season one. What does Bran know that we don’t?